Back in March, Sarah and I visited New York after attending Photoshop World in Boston. This was my fourth trip to Manhattan and Sarah’s 2nd so we’d seen most of the major tourist spots. This allowed us to relax a bit more and just take in the city without worrying about rushing to the next must see location. It was also a great opportunity for some photography and to try out the video capabilities of the new Canon 5D Mark II. 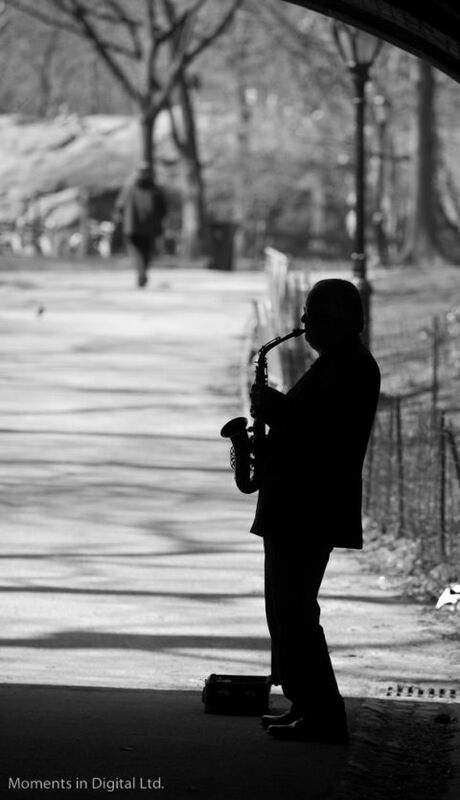 On a beautiful Monday afternoon while we were strolling through Central Park, we happened upon this man playing his saxophone under a bridge in Central Park and I just couldn’t resist shooting some video and taking some still shots. Hope you enjoy them! Here is one of the stills I shot. Hope you put some money in his pot. I always do when photographing street artists. PS to that – we did NYC on our RV trip this spring too. My 6th time, Rob about the same or maybe more – but never together. We did some outta the way things like the corner restaurant from Sienfeld. Was disappointed to find that the soup nazi has closed and turned into a chain. I never did knock that one off and now it’s gone. We saw a guy in the subway start playing guitar and singing and this lady starts singing with him out of the blue and she wailed! Man she could sing! I wanted to ask her where we could go see her perform outside of the subway. She helped him get some good donations before she got on her train. Gotta love NY. Sure did. I always try to do that too when shooting street artists.